Not only that, but apparently to get in he had to pull some very rich strings to get a waiver for a previous drug charge. Not just to enlist as a peon of course. But to enter as an officer… as a LAWYER. Can he get a law degree with a drug felony? Apparently if you have connections and enough money. How has this not become front page news? Imagine if this were one of the Bush daughters. They went to a party and they were awful, awful kids. Ol’ Uncle Joe’s son is discharged in disgrace from the Navy for drugs and it’s not even a blip on the radar screen. And no one thought to investigate the job his daddy got him with the largest gas company in Ukraine? Not a bit of a conflict of interest there is there considering what’s going on there with Russia? How is it that some political families get a “pass?” The mainstream media doesn’t just ignore them. It IDOLIZES them. Or how she had to “make her own way in life” despite her parents landing her that job through political connections. When she “just couldn’t get care less about money”, she left that job her parents got her and… went to work for her parents directly making lots of money. Is that the “tiny white lie” you told, Mrs. Clinton? 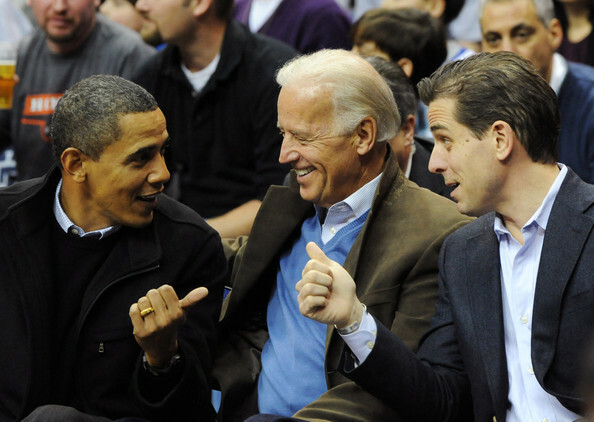 Maybe we’ll have a Clinton Biden White House after 2016.